meterUP is blocking me from making payment. What’s going on? meterUP will block payment in a zone when parking is restricted, or when parking is free. If you reached the maximum time limit three (3) consecutive times in a particular meterUP zone, you will not be permitted to start another parking session in that zone for a period of 30 minutes. Once those 30 minutes have passed, you are once again eligible to begin a parking session in that zone. Why does the parking rate increase after the maximum time posted? Note: If you choose to park past the posted time limit three consecutive times, you will be required to move your vehicle to a different meterUP zone. I paid for parking with meterUP but still got a ticket. What’s the problem? Note: It is very important to ensure your license plate number and meterUP zone number are correct before starting your parking session with meterUP. meterUP is the easiest way to pay for parking in Philadelphia. No more feeding the meter. No change? No problem! Just meterUP! How do I get meterUP? 1. Go to your smartphone’s app store, download and install the meterUP application. 2. Call toll-free 1-877-727-5303 and follow the prompts for personal assistance. How does the meterUP app work? Click here to see a quick video! Once you’ve signed up with meterUP, you can start using your mobile phone to pay for parking wherever you see the meterUP signs. 1. After creating a meterUP account, simply open the app and enter your parking zone number, which is located on meterUP signs, kiosks and meters. The meterUP signs will look like this. 2. Select your desired amount of time to park. 3. Confirm your information then press the “Start Parking” button and you’re good to go! Where can I pay for parking with meterUP? meterUP payments are accepted on streets with posted meterUP signs. Please Note: Each street block and street side has its own dedicated meterUP zone number. It’s very important that you select the meterUP zone number on the same side of the street on which you park. What payment methods are accepted in meterUP? The meterUP app and many of its features are free of charge, but, to pay for parking you’ll need to confirm a payment method. During the sign-up process, You can select credit/debit cards, Parkmobile Wallet, Visa Checkout and MasterPass as payment methods. Additional information can be found here. Parking time limits vary from location to location. I park at a location before parking regulations go into effect. Can I pay beforehand? Yes! If you park at a location before posted parking regulations go into effect, you can start a parking session. You will only be charged during the hours in which posted regulations are in effect. EXAMPLE: If you park at a location at 7 a.m. but payment isn’t required until 8 a.m., you are able to make a prepayment at 7 a.m.. From there, you will only be charged from 8 a.m. until your parking session ends. Yes! One of the great features of meterUP is customized parking notifications. To set up your customized notifications, go to the “Notifications” tab in your meterUP profile. How do I extend my parking session? Once you receive a reminder that your parking session will expire, you can extend your time up to the maximum posted time limit. Simply click the extend button in the app, or call 1-877-727-5303 after you have started a parking session. What’s with this 40 cent convenience fee? The 40 cent convenience fee is meant to ensure continued functionality of the meterUP app. The 40 cent convenience fee is applied whenever a transaction is completed within the app. This includes starting and extending parking sessions. Note: Payments at meters and kiosks don’t require a convenience fee if you choose not to start a parking session with meterUP. How does a Parking Enforcement Officer (PEO) know I paid through meterUP? When you pay with meterUP, we’ll ask you for your license plate. When the PEO enters your license plate number into their ticketing device, they’ll receive a notification that your vehicle is in a paid parking session. How do I review/edit my meterUP account? App: Open the meterUP app and go to your meterUP profile tab. Here you can change, add or remove vehicles, update your payment methods and edit your customized notifications. Any mobile phone: Dial toll-free 1-877-727-5303 and follow the prompts for personal assistance. Web: Simply sign-in to your personal account on meterUP.org using the email address and password you entered during the account setup process. I often park for a period that runs into the time when parking is free. Is meterUP smart enough to adjust for this? Yes! If you park for a period that runs into the time when parking is free (5:00-7:00 p.m. for example, when parking is free after 6:00 p.m.), meterUP will only charge you until 6:00 p.m. I heard I can pay with meterUP at select SEPTA train stations. Is that true? How do I obtain a copy of my meterUP receipt? ●	After opening the meterUP app, click the “Activity” tab in the bottom left corner. This will provide you with your recent parking transactions. ●	Receipts can automatically be sent to the email address registered to your meterUP account. Just go to the “Notifications” tab in your meterUP app profile to enable the “email receipt” notification. I have a disabled license plate/placard. How does meterUP give me the courtesy one hour free parking allowance? The scenario is exactly the same if you were parked at a stand-alone meter or kiosk. When the Parking Enforcement Officer inputs your plate number into their handheld ticketing device, they’ll check if you paid for a parking session with meterUP. If you’re not in a paid parking session, they’ll begin timing your vehicle and give you the free hour parking allowance. I want to pay for three hours of parking, but the app will only let me pay for two. What’s up? The app only lets you pay for parking up to the maximum time limit that is posted. For example, if you are parked in a two-hour zone, you can only pay for up to two hours in one session. The meterUP system, provided by Parkmobile, a PCI Level 1 datacenter, utilizes industry standard encryption methods to ensure details (name, credit card number, etc) are stored using strong encryption algorithms. Additional information can be found here. If meterUP is experiencing technical difficulties, does that mean parking is free? In the event of technical difficulties preventing payment through meterUP, the parking fee must be paid at the closest meter or kiosk. How can I contact meterUP? 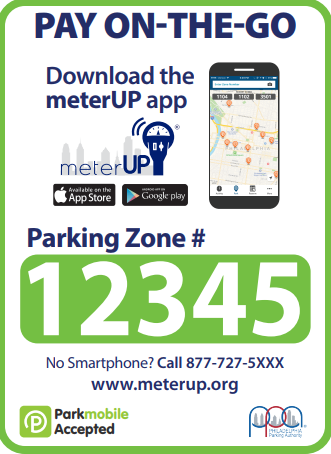 The meterUP service is provided by Parkmobile, LLC. For assistance with account management, you may call 1-877-727-5303 or contact the Parkmobile Help Center here. If you believe you were issued a ticket in error while using meterUP, simply email us at PPACustomerService@philapark.org, or fill out the online dispute form provided here. Please be sure to provide the parking ticket number and a copy of your meterUP receipt. Note: Again, it is very important to ensure your license plate number and meterUP zone number are correct before starting your parking session with meterUP.